What Will Become of The Divine Lorraine? It is unacceptable that this building, a national as well as a local landmark, is falling prey to demolition-by-neglect. 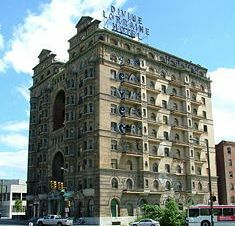 While the figure of Father Divine and the nature of his movement may be controversial, it is uncontroversial that he was an important precursor to the civil rights struggle, and that the Divine Lorraine had a significant role in this history, both by association and by virtue of its status as the first integrated hotel in Philadelphia. Further, it is a remarkable building, and one of the few Hale commissions still standing. The avarice of a developer who gutted the building, “taking her for all she was worth”, and then walked away, should not be allowed to cause the eventual destruction of this treasure. I would urge all of my readers in Philadelphia to get involved on some level with the preservation of this structure. And I would urge all of my readers outside of Philadelphia to spread the word. If there is enough public outcry over this, if the right people are appropriately shamed, perhaps the Divine Lorraine stands a chance of being a jewel of Philadelphia once again. We second Kingston. Read the history and view the pictures of this faded glory on N. Broad Street: The Kingston Lounge: The Divine Lorraine Hotel. This entry was posted in Community, Dangerous, Shell Properties, Urban Renewal by Stephen Arrivello. Bookmark the permalink.